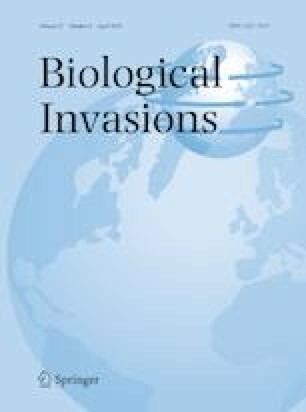 To control invasive species and prioritize limited resources, managers need information about population size to evaluate the current state of the problem, the trend in population growth through time, and to understand the potential magnitude of the problem in the absence of management actions. This information is critical for informing management actions and allocating resources. We used two national-scale data sets to estimate historical, current, and future potential population size of invasive wild pigs (Sus scrofa; hereafter wild pigs) in the United States. Between 1982 to present, the Southeastern Cooperative Wildlife Disease Study mapped the distribution of wild pigs in the United States. In addition, recent research has predicted potential population density of wild pigs across the United States by evaluating broad-scale landscape characteristics. We intersected these two data sets to estimate the population size of wild pigs in 1982, 1988, 2004, 2010, 2013, and 2016. In addition, we estimated potential population size if wild pigs were present at equilibrium conditions in all available habitat in each state. We demonstrate which states have experienced recent population growth of wild pigs and are predicted to experience the greatest population increase in the future without sufficient management actions and policy implementation. Regions in the western, northern, and northeastern United States contain no or few wild pig populations, but could potentially support large numbers of these animals if their populations become established. This information is useful in identifying regions at greatest risk if wild pigs become established, which can assist in prioritizing management actions aimed at controlling or eliminating this invasive species across broad to local scales. For inquiries about how this work informs the National Feral Swine Damage Management Program please contact ryan.s.miller@aphis.usda.gov. The online version of this article ( https://doi.org/10.1007/s10530-019-01983-1) contains supplementary material, which is available to authorized users. This study was funded and supported by the Wildlife Services/National Wildlife Research Center and Veterinary Services/Center for Epidemiology and Animal Health programs of the US Department of Agriculture/Animal and Plant Health Inspection Service, the National Feral Swine Damage Management Program, Colorado State University, Conservation Science Partners, and Arizona State University. Funding for preparation of the SCWDS distribution maps and development and maintenance of the NFSMS was through Cooperative Agreements with the U.S. Department of Agriculture, Animal and Plant Health Inspection Service, Veterinary Services. Support for this study was provided by the Department of Energy to the Savannah River National Laboratory under contract DE-AC09-08SR22470. J. Anderson assisted with calculation of prediction intervals. We thank B. Dickson and reviewers for providing thoughtful feedback that improved earlier versions of this paper.